Kenneth Lonergan’s long-awaited follow up to YOU CAN COUNT ON ME has – after a four-year-long editing squabble, and a final edit by Martin Scorsese and Thelma Schoonmaker – finally been released. It seems to attract considerable attention among a British audience - a diverse crowd filled the outdated screening room at the Odeon Panton Street just off Leicester Square on a recent Sunday afternoon to watch the GANGS OF NEW YORK writer’s contemporary take on Upper West Side city life. 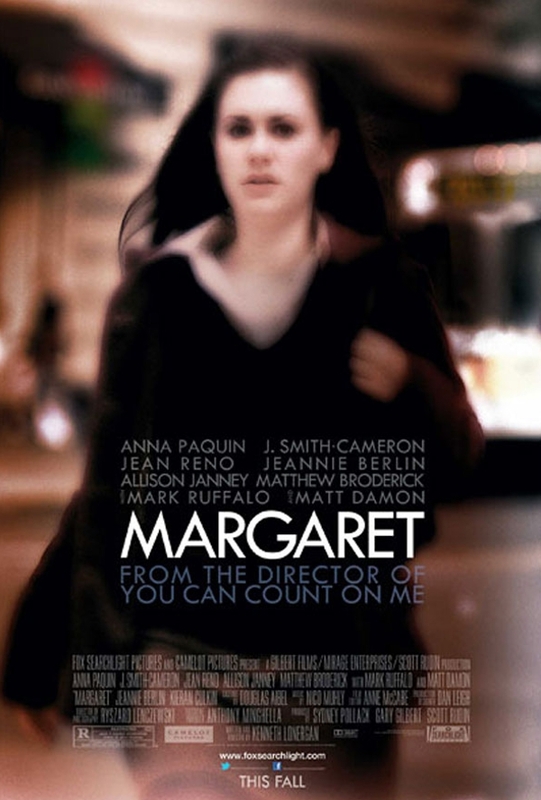 MARGARET is a daring coming-of-age tale that lets the 17-year old Lisa (Anna Paquin) become witness of a traumatic accident that proves to be formative on her young life. During the 2.5 hours of the final edit we watch the different emotional states the troubled teenager goes through during her rite de passage of becoming an adult. The woman who got rolled over by a bus after a quick meeting of the eyes by its driver with Lisa, is a sacrificial victim to the development of the main character, who, in turn, is searching for different ways to overcome her guilt. Growing up is not an easy business; plenty of tears will need to flow before a certain level of emotional maturity can be reached. My take on this film is, furthermore, that it aims to assert the role of so called high culture and allows a largely disenfranchised society to rebuild its values according to those guidelines drawn out by classic drama and poetry, to some extent. The Met plays an important part in the movie. Bellini’s Norma opens her heart to Ramon (Jean Reno), which has a profound effect on his relationship with Lisa’s mother Joan (J. Smith-Cameron). La nuit d’amour in Offenbach’s Tales of Hoffmann triggers the cathartic reunion of mother and daughter. The classroom is a frequent topic, where contemporary politics in the aftermath of 9/11 are juxtaposed with the musings of King Lear. Avoiding the pitfalls of intellectualization, Mr Lonergan does not use those references to show off, or distract from the story he is telling, but just melds them into his trope of big city life. An ode to New York and its culture it is, but not an unambiguous one. MARGARET went on limited release in the US in September and in Canada in October. It is on such limited release in the UK that it's only playing on one screen in Central London! Catch it while you can, or wait for the French release in August 2012. I was also dragged along to see this movie, but wasn't surprised by the crowded theatre. The film had, after all, been championed by one of the UK's most respected print critics, Peter Bradshaw, and this was the only place in town to watch it. I admired rather than enjoyed the flick. Even at two and a half hours, it's painfully long, partly because it simply does try to tackle too much, and partly because the female characters are so uniformly narcissistic and destructive and the men so stupid that it's painful to spend so much time with them. That said, precisely because Lonergan has had the balls to write such beastly women, and because Paquin commits so fully to the role, the film MUST be admired. As a portrait of a spoiled brat doing anything, anything to avoid an admission of guilt, it's a compelling portrait, but housed in a film that is way too baggy. As for the importance of the Met, I found the two choices of aria clichéd and of little relevance to the text.